Have you picked out the perfect jack-o-lantern pumpkin yet? Indulged in any pumpkin spiced treats? I haven’t gotten around to either yet, but have been reveling in the autumn season so far! We have had a beautiful burst of fall like weather in Texas. For once, it has been slightly less hot and humid out and we have made a concerted effort to get outside and soak it all in! I’m so excited to show you some of the new Fall décor around our home this season. So let’s start with the front door. I still love to use my Chevron Burlap Wreath in autumn, but this year I have added purple mums, begonias and a few straw pumpkins. I love the added warmth of these inviting floral touches. Moving on to our Entry. In past years I hadn’t done much decorating in our Entryway. Maybe change out a few branches in the tall vase next to my mirror, but that’s about it. This year I decided to spread the orange/pumpkin love and incorporate aqua/turquoise with a hint of red. I draped our entry table with linen and added a bit of the Ming Dragon in Aquatint from Robert Allen’s Dwell Studio line. This fun print pulls everything together perfectly! Last year’s decorations in the living room can be seen here. And as you can see, I went a little pumpkin crazy. Pumpkins from edge to edge. This year I am using my apothecary jars, a few of my milk glass pieces, and some other fall colors like plum and green. Thus far, I’ve styled the apothecary jars for both Christmas and spring. They have been a great addition and I’ve enjoyed coming up with new ways to adapt their décor for the coming season. Meanwhile, incorporating multiple natural elements such as artichokes, pomegranates, and acorns along with the usual pumpkins reminds me of harvest. That’s all for now, but be sure to check back soon for some of my favorite fall décor across the web. How have you styled your home for the autumnal season? Yesterday, in Part 1, I went over the inspiration for my baby sister, Maggie’s, dorm room as well as some of the selections. We wanted to make this a comfortable space that felt warm and cozy as opposed to a cold and impersonal cinderblock box. 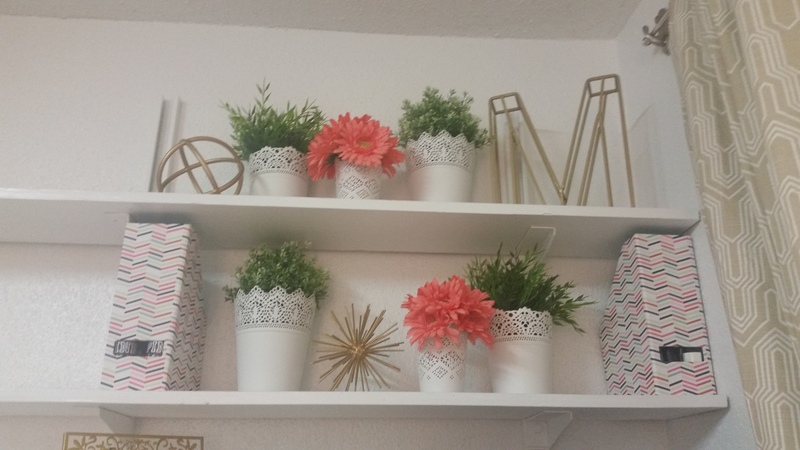 Maggie has a spunky and fun personality, so we wanted the decor to reflect that. Once we had selected the main decorative elements, such as duvet cover, desk accessories, armchair and rug, we needed to fill in with lighting, art and accessories. In general, dormitories employ overhead fluorescent lighting. While very functional, it does not provide the same ambiance as other forms of lighting such as floor lamps, table lamps and desk lamps. Maggie already had an adorable desk lamp from IKEA so the only remaining item needed was an adequate floor or table lamp. In this case, we decided to use a vintage piece from our parents’ house (aka free). It was a 70’s era floor lamp/table in a slightly dated wood tone with a more formal shade. We painted it navy, grabbed a new drum shade at IKEA, added some grosgrain ribbon and voila! With all of that being said…. It’s time for the grand reveal! We raised the bed to accommodate a mini-fridge and lots of stackable, rolling IKEA storage below. The floor lamp got an extra boost from a milk crate so that it would be high enough to comfortably light the bed. Since the light had a three-way switch, we were able to use a 75/100/150 bulb to offer multiple brightness levels. The pillows are a mixture designer fabrics that were in our free stash. Often, with less than a yard, we were able to get one pillow from a small piece of fabric. This is where spending a bit more can make a big impact! The chair looks fantastic with Dritz Polished Brass Nailhead Trim. We used the same type of nailhead tape that I have used on my desk chair and Greek Key Headboard. Meanwhile, a funky and fun accent pillow finishes off the look! For the desk area, we decided to keep things simple on the shelves. We love the combination of the geometric pattern of the HEJSAN accessories with the SKURAR pots and greenery. A few gold metallic pieces and three prism shaped objets pulled everything together! The curtains were a steal at Tuesday Morning and present a neutral enough color and design that they go well with the décor of any roommate. I think this will be a calming yet practical space for late night study sessions! I completely forgot to take a photo of the rug before we headed out on Move-in day! So Maggie was nice enough to send this pic earlier in the week. It is already getting a lot of use! 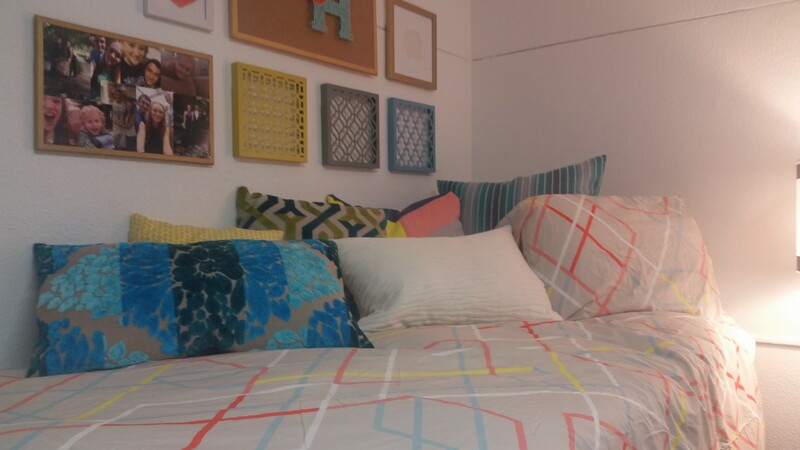 We had an absolute blast planning, DIY-ing and installing this comfy slice dormitory heaven! More importantly, it was a blessing to be able to start off Maggie’s college career in a space where she feels comfortable and inspired! I’d love to see other fun dorm room designs! Have you done anything fun with dorm décor? If you did, consider yourself lucky as some are still waiting for them to come in the mail. I would not necessarily call myself an Ikea addict, but many of their items grace my home. Ikea is renowned worldwide for making decent products at affordable prices. Every year when their catalog comes out, new products are displayed and hosts of their other merchandise is staged in inviting and accessible spaces. This new MOCKELBY trestle table will certainly be a new staple. Meanwhile, one could set this beautiful table with the new SITTNING collection. Although they are already being sold in stores, the FJALLA boxes are an excellent and attractive storage option. And I love the new RADVIKEN chair! The new TJUSIG collection will have you reorganizing your entry/mudroom. The ALMASTA chair is probably another soon-to-be favorite of mine. This particular product really caught my eye. I have been seeing lots of patterns like this in high end fabrics and I am supremely impressed with the style and vibrancy of this new print! As you flip through the pages of the new catalog, you may find yourself drawn to a few of their existing pieces. I am very fond of the HOLMSEL chair and its tasteful lines. I am still trying to find an excuse to buy place to use the ALSEDA stool. It would be fantastic both indoors and outdoors! And the adorable BRADA would be great for a dorm or teen room! The TORKIS boasts many utilitarian uses from laundry basket to doggy bath. However, I will be forever drawn to the STOCKHOLM chandelier. This is the closest my current budget could get to a gorgeous crystal chandelier… and in the case of the STOCKHOLM… I’m perfectly OK with that! If you are not on IKEA’s catalog mailing list or would like to view the 2016 catalog online, follow this link to see more. Would you like to use any of these pieces in your home? What is your favorite IKEA piece?